There are many advantages to being tall, but push-up ability is not one of them. While height may give you an advantage on the basketball court or in a crowd, it slightly hampers your ability to excel in most body-weight exercises. The reason why boils down to some very simple physics. The taller you are, the bigger you are. The bigger you are, the more mass you have. The more mass you have, the more work you have to do to push yourself up. That's the first reason that taller people will naturally have a harder time with push-ups than shorter people. Simply put, they need to do more work in order to do a push-up. Read More: Is a Bench Press Affected by Arm Length? Being taller also means that you have longer limbs. There are some differences in proportions (some people have short arms relative to their body and some long) but generally speaking being taller means having longer arms. 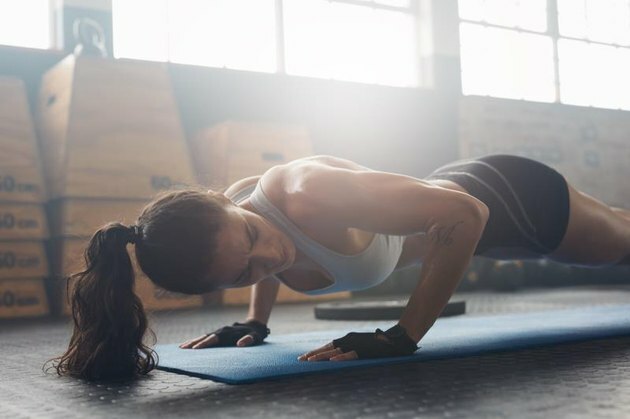 Longer arms make the push-up more difficult because they increase the amount of distance that your body has to travel to get down to the ground. For every inch longer that your arms are you have to travel an inch farther in a push-up. When you increase the amount of distance that you perform an activity for, you increase the amount of work you need to do, explains an article on Georgia State University's website, which describes the nature of work according to physics. Imagine that you are carrying a heavy sandbag for 100 yards. It will obviously take more energy to carry it 10 yards farther. Longer arms force you to travel more distance, which increases the amount of time that you have to exert yourself, which makes the push-up more challenging. Push-ups are what's known as a second-class lever in physics. Your body pivots around your toes, the weight itself is your body with the center of your body weight hovering around your hips. Your arms are actually doing the moving, pressing you up and guiding you back down. The fact that the weight (your body) is between the axis (your toes) and the thing that is moving you (your arms) gives it the distinction of second-class lever. The problem with a second-class lever is that it needs to be stable in the place where all of the weight is pressing it down. Since your hips are the center of mass and are in the air, and both your hands and feet are on the ground, gravity is pulling your body down at the hips. This is why many people sag their hips down when they are struggling with a push-up. You need a certain amount of abdominal strength in order to complete a push-up, to keep your hips from sagging. The taller you are, the longer your body is, and the farther your hands and feet are from your hips. The farther your base of support moves from the center, your hips, the greater the amount of force that pulls the hips down. Imagine a bridge that stretches across a river. Usually, there is a support under the bridge on either side, near the bank of the river. There is usually also one support girder under the middle of the bridge, particularly if it is a long bridge. Imagine that you take this support out from under the middle of the bridge. It would probably buckle without support, possibly bend and ultimately not be safe. In a push-up, the greater the length of your body, the greater the force pulling your hips down. This may make it look like taller people have weaker abs and core muscles because they tend to let their hips sag more. Really, they are just fighting against the laws of physics. While it may seem obvious that being taller makes push-ups harder, there is also some benefit. Your muscles grow in proportion to your bones, which means that you have bigger muscles to go along with your bigger body. While you are fighting against a larger body weight and greater range of motion through the push-up, you can also gain more muscle mass than a shorter person, pound for pound. For example, taller people generally have better grip and leg strength, according to a 2011 study in Health, which looked at height, weight and body measurements of teenagers to see if they correlated to strength. This makes sense, because taller people have more mass overall with which to work. Is a Bench Press Affected by Arm Length? What Are the Benefits of One-Arm Push-Ups?